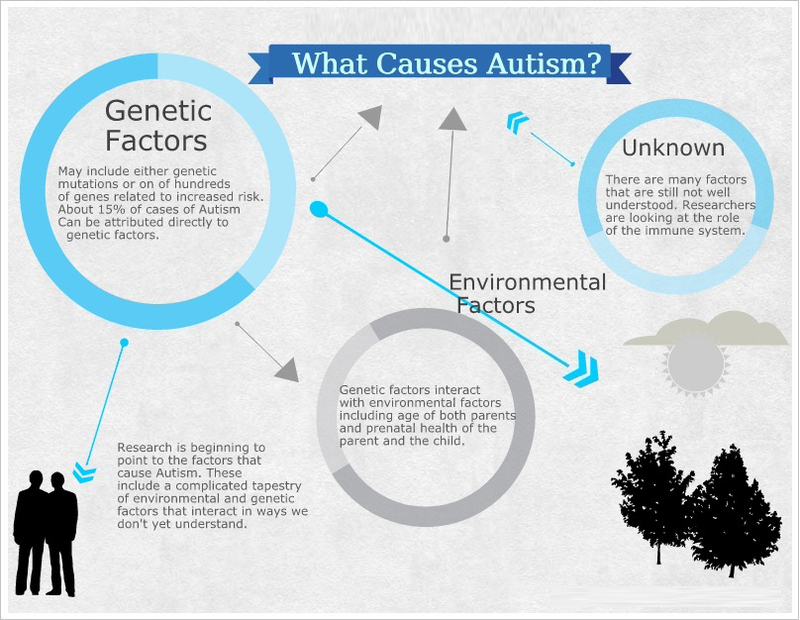 Autism is a neurodevelopmental disorder which can not be cured, but it can be managed. Know what challenges they could face & how we can improve their condition. Autism, also called autism spectrum disorders(ASD), refers to a range of complex disorders of brain development. These disorders are characterized by pervasive and usually severe impairment of reciprocal social interaction skills, communication deviance, and restricted stereotypical behavioral patterns. Autistic disorder, best known as classic autism, is the most severe form of ASD. Other conditions along the spectrum such as Asperger syndrome, Rett’s disorder, and childhood disintegrative disorder, are milder forms of the disorder. Genetics – Primary factors to affect the DNA makeup. Many children with autism have a relative with autism or autistic traits. Genomic research begins to discover that people with autism spectrum disorders probably share genetic traits with those who has attention-deficit hyperactivity disorder (ADHD), bipolar disorder, schizophrenia, or depression, suggesting that the five mental disorders have the same common inherited genetic variations. They have found irregularities in several regions of the brain; others that people with autism have abnormal levels of several neurotransmitters in the brain. Such abnormalities underlying in conditions of autism could result from the disruption of neurodevelopment early in fetal development caused by a defective gene. Environmental Factors – Nongenetic stresses appear to increase further a child’s risk of developing autism, involving events before and during birth. Parental age at the time of conception. A research study suggests that if the father is older during conception, there is a greater risk of autism for the baby. The presence of maternal illness during pregnancy (gestational diabetes, infection) and certain birth complications during childbirth, particularly those involving periods of oxygen deprivation to the fetus’ brain. The risk of having a child with autism increases with pregnant women who fail to take prenatal vitamins containing folic acid and eat a diet rich in folic acid at least 600 microgramsperform actions a day. 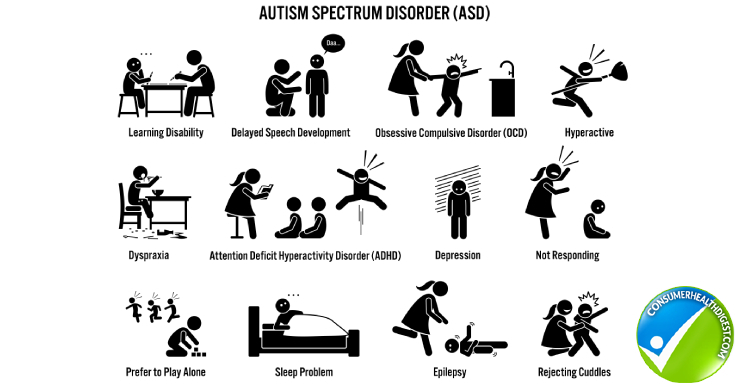 Below is a list of the commonly found characteristics identified among people with autism. Most children who develop autism have difficulty engaging in the give-and-take of everyday human interactions, such as failure to respond to their names, and reduced interest in people. Shows difficulty playing social games and in imitating actions of others. They prefer to play alone. May have episodes of crying or having outbursts in inappropriate situations, tendency to “lose control” in frustrating situations. Young children with autism tend to be delayed in babbling and speaking and learning to use gestures. They may speak only single words or repeat the same phrase over and over, and display echolalia. May have high-pitched sing-song or a flat, robot-like voice. They perform actions referred as stemming and they see it as self-stimulating. They need extreme consistency in an environment and their daily routine. Repetitive behaviors can take the form of intense preoccupations and they may develop tremendous interest in numbers, symbols, dates or science topics. Educational/Behavioral Interventions – Involves training sessions that help children develop social and language skills. Medications – May be prescribed for the treatment of specific autism-related symptoms. Antipsychotics (Haloperidol, Risperidone) for severe behavioral problems.